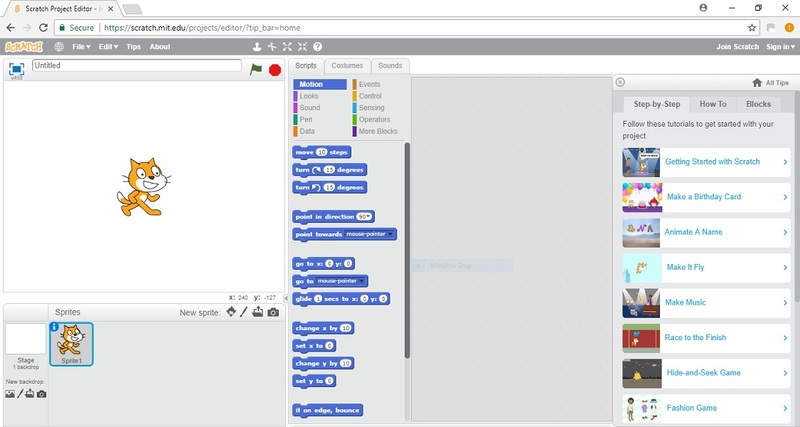 Scratch makes it easy for you to program your own interactive stories, games and animations, through colourful drag-and-drop blocks. It comes with some background images, characters and sounds ready to use, but you can also add your own images and sounds, making it even more fun. Programming in Scratch is an ideal way to encourage creativity and problem solving skills, while also helping them to become more confident with ICT skills that could help them in many future careers. Because it runs in your web browser there is no need to download and install any additional software (see below), you just need to visit a web page in exactly the same way you are looking at this one. The software comes from the Lifelong Kindergarten Group at the MIT Media Lab, and is safe to use. See the Scratch ‘For Parents’ page for more information. Your child doesn’t need to sign up for anything, but it will make saving their work easier and allow them to work on any computer. There is a free online moderated community that your child can join where they can share their projects with others. No personal details are needed for this, just a username (which can be anything) and a password. For the purposes of the club a generic club account will be allocated, but a personal one makes it easier to keep projects after the club has finished (the accounts will be wiped clean and re-used next time). There is a huge benefit in sharing projects and receiving and giving constructive comments. Scratch runs on any computer that has a browser that supports Adobe Flash. This means that you can use Windows, Mac, ChromeOS or Linux along with a modern browser such as Chrome, Firefox, Safari, Edge or Internet Explorer 11. There is also a downloadable version. For more details see the Scratch FAQ.